A long-standing lucky streak recently ran out for me. For the first time ever, I had to put down a much-loved pet: my cat Zoë. Weathering the emotional aftermath involved a multi-season "The West Wing" marathon on Netflix, most of a bottle of Armagnac, and a lot of damp-eyed quiet time in the kitchen. 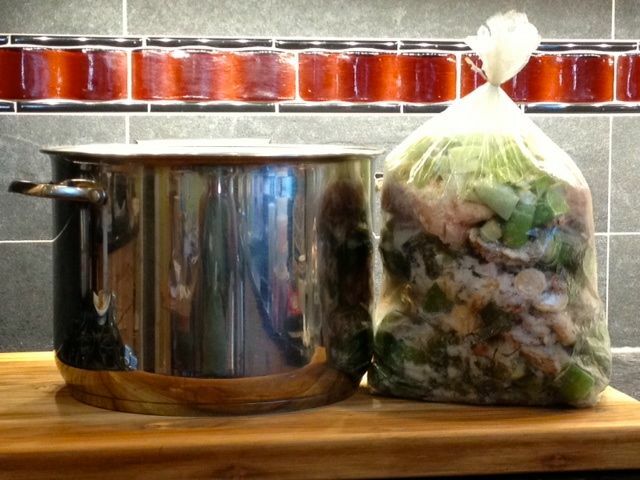 Much of that time I spent staring into a large pot filled with bones, vegetable trimmings, and water — what for all the world looked like a useless mishmash of cooking detritus — gurgling peacefully on a back burner. I was making stock. Death isn’t a stranger to me. Myriad remarriages in my family provided me with an overstock of grandparents and parents, none of whom are still living. My sole aunt and uncle have long since departed, as have too many good friends from various stages of my life. A few years back, I realized that whenever I faced a significant tribulation or loss — be it of a friend or a parent or, now, a pet — I seem, reflexively, to make stock. It's a soothing, slow-paced, and low-impact activity that's nevertheless constructive, since the resulting elixir is the keystone of so many meals. The process always helps me manage the sting. Making stock offers benefits on several levels. First, it feels just a little bit magical when something so useful, perhaps even precious, results from seemingly nothing: scraps that might otherwise be compost- or trash-bound. Second, the stockpot provides a non-demanding focus for a distracted, mopey mind. Third, and arguably best of all, is the aroma. A simmering pot of any stock (though particularly chicken) fills the house with the scent of homemade, signaling warmth, security, calm, and well-being. To me, it feels almost like burrowing under my favorite blanket on a raw, stormy Sunday. Within the last two weeks, the ham stock anchored a mighty pot of split-pea soup and a riff on Pommes Boulangère, a potato gratin with leeks, wine, and stock (usually chicken, but the ham was terrific, too). And some of the chicken stock became one of my favorite soups of all: Greek avgolemono. I also squirrel away, in separate bags, chicken and beef bones and shrimp and lobster shells. When the frozen stock supply dwindles, the stock bags mean that all the makings are at my fingertips, and I can mix and match to make whatever flavor I need. 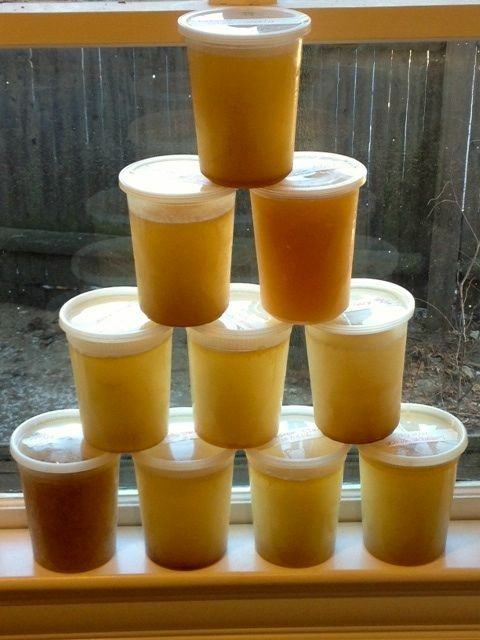 Do my stocks have the clearest, cleanest, purest flavors of all the stocks in the land? Admittedly, no. But the rich, gelatinous, lip-smacking body of a deeply savory chicken stock, cooked at a bare simmer for a few hours to extract as much collagen as the joints and bones can offer, still beats the store-bought stuff hands down. And I can say with ironclad certainty that a container of Swanson’s, as easy and good as it may be, wouldn’t have done much for me when I got home from the vet with an empty cat carrier.